The Bakehouse01263 715779work01603 870304fax Self-cateringThe Bakehouse is situated in the lovely village of Hindolveston, which has a small farm shop and community cinema screenings and music events. It is a short drive to the pretty Georgian town of Holt and the North Norfolk coast andmany walks and cycle rides may be enjoyed from the property. The Bakehouse is situated in the lovely village of Hindolveston, which has a small farm shop and community cinema screenings and music events. 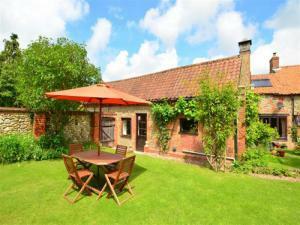 It is a short drive to the pretty Georgian town of Holt and the North Norfolk coast andmany walks and cycle rides may be enjoyed from the property.